The theater department is getting ready for their premier of Play On tonight, Thursday March 7th at 7 p.m. in the Mooresville High School Auditorium, with a follow up performance on Friday the 8th. Admission is $5 for anyone over the age of five. “The writer keeps changing everything last minute, and on the opening night, everything that could go wrong, does,” senior MacKinsey Taylor said. The idea of a play within a play was new for some of the cast, but overall well liked. "It sounds like a great idea. The crowds really going to like it," junior Josh Passey said. The play is agreed to be great for a high school production. "It's good for high school students to watch and act in. 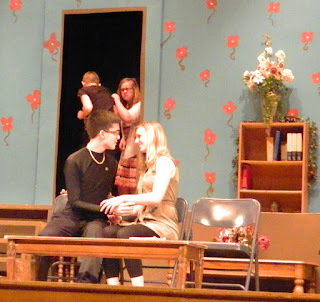 It shows the hilarious truths of what goes on in a play,” student teacher Kaitlyn Yearwood said. The play must be a crowd pleaser; it's actually a redo from 10 years ago, but with some changes to allow more chances for casting. Much thought goes into the picking of a play for the spring production. “I want to enjoy it and connect with it personally, because I spend so much time on the play. I also look at the crew that's returning, and try to pick a play that will allow a lot of spots,” Kassen said. This year’s play will be a first for more than just freshman. Junior Josh Passey and sophomore Ricky Yutmeyer are fresh to experience. "It was a little weird because I had never taken her classes, and walking in against people that had taken them, but I took musical theater and enjoyed it, so I thought, why not," Passey said. For another, the spotlight seemed appealing from the crew backstage. "I was helping out last year, stage crew, and my friend really loved it. Just how great last year’s play was," Yutmeyer said. Even though they weren't freshman, the two novices still had their doubts. "At first I didn't know I would make it, but the second day Hannah and I did a love scene and everyone thought it was amazing," Yutmeyer said. Passey just focused on the upside. "I felt pretty good about getting a part," Passey said. Several of the cast members even act outside of school. Freshman Cearra Guisbert, freshman Maryssa Small, sophomore Austin Webster and senior Caitlin Goings and are a part of community theaters. For some, this is just a hobby. “My love for theater is growing bigger and bigger, I’ll enjoy it the next two years. I don’t think I’ll pursue it after high school but that might change,” Yutmeyer said. And for others it’s hopefully the beginning of a career. Caitlin Goings has been acting since she was 10. “I have a tryout over spring break at the New York film academy. Then I have try out in March at the American Musical and Drama Academy,” Goings said. Some of the actors can relate greatly to their characters, while others are complete opposites. MacKinsey Taylor, playing Gerry, a lead, has the opposite personality as her role. “She gets to boss everyone around and take charge,” Taylor said. These actors are eager to showcase their talents, so go to the premier and show support for the drama department.